Tesco’s security concerns seem unfounded given that Google Chrome – which, incidentally, is based on same the WebKit rendering engine as Safari - was recently proven to be one of the most secure browsers. 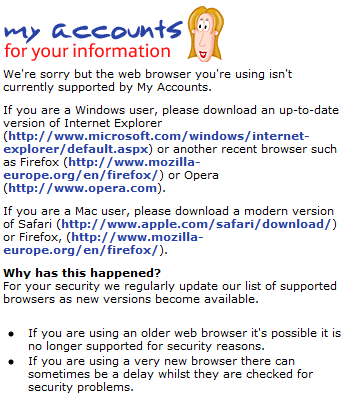 Also, despite the site’s recommendation of a “modern version of Firefox”, I found that I was also prevented from logging in using the latest version of Firefox 3.6. Trusty (or should that be rusty?) old Internet Explorer 6 seems to work fine, and that’s not a particularly secure browser by any stretch of the imagination! Strangely, I’m able to log into my Tesco Bank credit card account just fine with Chrome; it’s just the savings area that locks me out. Fortunately the only reason I logged in was to withdraw my full balance ready to add to my 2010/11 ISA, but if I were looking to continue saving with Tesco, their short-sighted approach to browser support would certainly have me thinking twice. I recently purchased a hard drive from Scan.co.uk – one of their Today Only specials. At checkout, they automatically add Scansure Protection - an insurance policy which protects against installation damage. This is a bit sneaky, and because I wasn’t really concentrating, I neglected to remove it. It only cost me £2.30, but that’s money wasted as I have been building my own machines for years now and it’s unlikely I’d damage the drive. Unfortunately, from browsing the Scan forums, it seems that it’s impossible to cancel Scansure after going through with the order. This experience probably won’t stop me buying from Scan in the future, but I’ll certainly be more careful. Ideally I think Scansure should be opt-out rather than opt-in, or at the very least there should be an option for registered users to disable Scansure permanently on their account. I have been using Gmail since its early invite-only beta days in 2004. As explained by Google, they were involved in a dispute over the use of the Gmail name in the UK, so they were forced to rebrand the UK service to Google Mail in 2005. Existing UK users were allowed to keep their @gmail.com address (although the logo on the Gmail interface switched to the new Google Mail logo), while any new customers were assigned a @googlemail.com address. Fast forward to today and it appears that Google have reached a settlement, as they have rebranded back to Gmail in the UK. Effective immediately, new UK users will again be able to sign up for @gmail.com addresses, while existing users will be able to choose whether to switch or to keep their old @googlemail.com addresses. The Google Mail logo will also be phased out and replaced with the Gmail logo. This doesn’t really mean much in the grand scheme of things, as whether the “official” email address (as displayed in the Gmail user interface and in the From field of all sent emails) is @gmail.com or @googlemail.com, the domains are actually interchangeable, but it’s still a good step forward which will eliminate a lot confusion. The only country in which the Google Mail brand now exists is Germany, where there is an ongoing dispute between Google and the owners of German company G-Mail. Maybe Google will now look to resolve this and be able to offer Gmail as a truly global brand.